The Canaan Dog, also known as the Palestinian Pariah dog and the Bedouin Sheepdog, is a breed of pariah dog, which has been in existence in the Middle East for thousands of years. [page needed] There are 2,000 to 3,000 Canaan dogs across the world, mostly in Europe and North America. Excavations in Ashkelon unearthed the Ashkelon dog cemetery, the largest known animal cemetery in the ancient world, containing 700 dog skeletons all of which were anatomically similar to the Canaan dog of modern times. Archaeologists hypothesize that the dogs were revered as sacred animals. According to tradition, the Canaan dog was the guard and herd dog of the ancient Israelites, guarding their camps and flocks. At the time of the Diaspora, this tradition continues, the Israelites were forcefully removed from their land and had to leave behind their dogs. These dogs reverted to the wild. Avoiding extinction, they remained undomesticated for the most part, although some lived with the Bedouins and earned their keep by guarding the herds and camps. Some were also guards for the Druze on Mount Carmel. Dr. Rudolphina Menzel (1891–1973) used these intelligent scavenger dogs mainly found in the desert as guard dogs. In the 1930s Menzel was asked by the Haganah to build up a service dog organization. She captured a select group of semi-wild individuals, tamed, trained and bred them. Menzel found the dogs highly adaptable, trainable, and easy to domesticate. It took her about six months to capture her first dog, Dugma, and within a few weeks she was able to take him into town and on buses. She began a breeding program in 1934, providing working dogs for the military and she gave pups to be pets and home guard dogs. She initiated a selective breeding program to produce the breed known today as the Canaan dog. In 1949 Menzel founded The Institute for Orientation and Mobility of the Blind, and in 1953, she started to train Canaan dogs as guide dogs for the blind. Although she was able to train several dogs, she found that the breed was too independent and too small for general guide dog use, although some of her dogs were used successfully by children. Her breeding program was concentrated with the Institute, where a foundation of kennel-raised Canaan dogs was established, carrying the name "B'nei Habitachon". She later supplied breeding stock to Shaar Hagai Kennels which continued in the breeding of the Canaan dog. After her death in 1973, Shaar Hagai Kennels, managed by Dvora Ben Shaul and Myrna Shiboleth, continued the breeding program according to her instructions. In addition, a controlled collection of dogs of the original type was continued, primarily from the Bedouin of the Negev. Collection of wild Canaan dogs has become very difficult. Many of the Canaan dogs living in the open were destroyed by the Israeli government in the fight against rabies. The spread of the human population into areas that were formerly isolated, along with their pet dogs, has resulted in the loss of the natural habitat of the Canaan. Even the majority of Bedouin dogs today, other than those of tribes still living a traditional and isolated life style, are mixed with other breeds. Myrna Shiboleth visits the Negev regularly, looking for good specimens living by the Bedouin camps, that she can breed with her dogs and use to strengthen the gene pool. The Canaan dog is a typical primitive dog in appearance. It is a medium-sized square built dog, with a wedge-shaped head, erect and low set ears with a broad base and rounded tips. Its outer coat is dense, harsh and straight of short to medium-length. The undercoat should be close and profuse according to season. Color ranges from black to cream and all shades of brown and red between, usually with small white markings, or all white with colour patches. Spotting of all kinds is permitted, as well as white or black masks. Rudolphina Menzel, an immigrant to Mandate Palestine from Austria, having studied the desert free living dogs and the variations in appearances, classified these canines into four types: 1) heavy, sheepdog appearance, 2) dingo-like appearance, 3) Border Collie appearance, 4) Greyhound appearance. Menzel concluded that the Canaan dog is a derivative of the Type III pariah — the collie type (referring to the type of farm collie found in the 1930s which was a medium dog of moderate head type more similar to today's Border Collie, not the modern Rough Collie). In writing the first official standard for the Canaan dog, Menzel wrote: "Special importance must be placed on the points that differentiate the Canaan-dog from the German Shepard [sic] dog, whose highly bred form he sometimes resembles: the Canaan-dog is square, the loin region short, the forequarters highly erect, the hindquarters less angular, the neck as noble as possible, the tail curled over the back when excited, the trot is short (see also differences in head and color)". Canaan dogs have a strong survival instinct. They are quick to react and wary of strangers, and will alert to any disturbances with prompt barking, thus making them excellent watchdogs. Though defensive, they are not aggressive and are very good with children within the family, but may be wary of other children or defensive when your child is playing with another child. They are intelligent and learn quickly, but may get bored with repetitive exercises or ignore commands if they find something of more interest. Canaan dogs can compete in dog agility trials, obedience, showmanship, flyball, tracking, and herding events. Herding instincts and trainability can be measured at noncompetitive herding tests. Canaans exhibiting basic herding instincts can be trained to compete in herding trials. 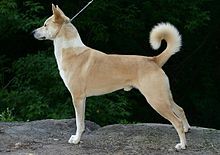 In general, the Canaan dog does not suffer from known hereditary problems. Although the breed is one of the healthiest, George A. Padgett, DVM, listed diseases that have been seen, at one time or another, in the Canaan dog: hypothyroidism, epilepsy, progressive retinal atrophy (PRA), cryptorchidism, hip dysplasia, elbow dysplasia, luxating patella, and osteochondritis dissecans (OCD). The Canaan dog was first recognized by the Israel Kennel Club in 1953 and by the FCI (Federation Cynologique Internationale) in 1966. The first accepted standard was written by Dr. Menzel. In 1986, the first Canaan dogs were brought to Finland from Sha'ar Hagai Kennel, in Israel. The Canaan Dog is today recognized by all the world's kennel clubs and is being bred in many countries. There are breed clubs in the U.S., Canada, the U.K., Finland, Germany, Israel and France. The first Canaan dog came to Canada May 16, 1970. The dogs came from a kennel in Delaware. The Canadian Canaan Club was formed in 1972, and the first executive of the Club was elected on March 15, 1973. The club has since been dissolved. The Canaan dog obtained entry into the Miscellaneous Class of the Canadian Kennel Club on December 1, 1975. In January 1993, the breed was accepted in the Working Group, as the Canadian Kennel Club did not have a Herding group at that time. The first Canaan Dog was brought to the UK from Lebanon in 1965, before they were a recognized breed. In December 1970, they were recognized by the Kennel Club, and the breed was placed in the Utility Group. In May 1992 the inaugural meeting of the Canaan Dog Club of the United Kingdom took place. Since 1996 the breed has begun to grow in numbers in the UK, though it is still quite numerically small. On September 7, 1965, Menzel sent four dogs to Ursula Berkowitz of Oxnard, California, the first Canaan dogs in the United States. The Canaan Dog Club of America was formed the same year, and stud book records were kept from these first reports. In June 1989, the Canaan dog entered the American Kennel Club (AKC) Miscellaneous Class. Its profile was raised when John F. Kennedy Jr. purchased a Canaan dog in the 1990s. Canaan dogs were registered in the AKC Stud Book as of June 1, 1997. The dogs began competing in conformation on August 12, 1997. ^ a b Brulliard, Nicolas (March 28, 2012). "In Israel, a battle to save the ancient Canaan dog". The Washington Post. Retrieved March 28, 2012. ^ Boyd, Lee (1995). Canaan Dog. Tfh Publications. p. 9. ISBN 978-0793808007. ^ Free Ranging Dogs - Stray, Feral or Wild? ^ "Report on the Canaan Dog by Israel Nature Reserves and National Parks Authority". Archived from the original on January 18, 2013. ^ "1960 - Israel Kennel Club". Archived from the original on October 16, 2010. ^ Hartnagle-Taylor, Jeanne Joy; Taylor, Ty (2010). Stockdog Savvy. Alpine Publications. ISBN 978-1-57779-106-5. Wikimedia Commons has media related to Canaan Dog.